A rare opportunity and an absolute MUST to view! 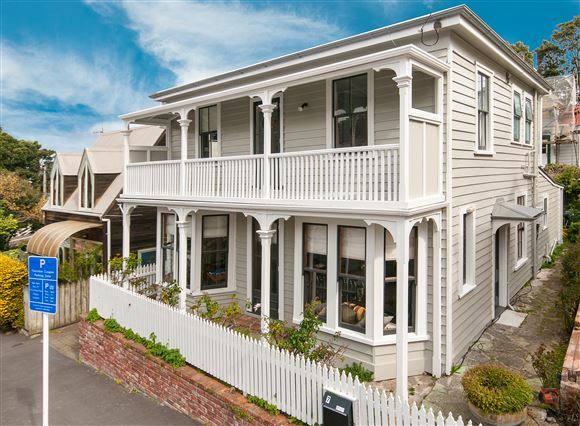 This gorgeous property oozes character and 1850's charm. The original "Cottleville Family Home" features bay windows, leadlights, beautiful Kauri joinery and second story verandah. Bevelled glass doors open out to a sheltered and private cobbled stone cottage garden which enjoys afternoon sun. With four bedrooms, three living rooms, this home is perfect for entertaining and family living alike. Located on the edge of the CBD, it offers tandem parking and Wellington College zoning. RV$770,000. Be proud to own a unique slice of Wellington history. Chattels remaining: Drapes, Fixed floor coverings, Light fittings, Stove, 3 wall heaters. Original painting of the property.